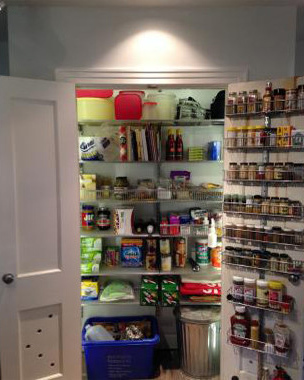 Maximize your pantry space! Our exclusive, top-rated Elfa Door & Wall Rack system makes the most of often-wasted vertical space on a door or wall and is totally customizable! Available only at The Container Store, you'll love how the six baskets can be easily repositioned to fit your storage needs. It's easy to remove one of the baskets if you need to take ingredients to another area. Build your own customized solution with our Elfa Utility Door & Wall Rack Planner. White Elfa Utility Pantry Door & Wall Rack is rated 4.9 out of 5 by 13. Rated 5 out of 5 by MARGET from A Great Pantry Door Storage Solution! I love this Elfa system! We installed it on the back of our pantry door. It freed up so much space in the pantry and cabinets. I use a lot of spices and now it's very easy to find them. We were happy that it was so easy to install and the baskets are quickly and easily attached or removed for rearranging. Rated 4 out of 5 by const from My son installed this elfa pantry rack relatively easily to a concrete wall in our very small kitchen. It's great to have the extra space for storage. The baskets wobble even when weighted down with items, but the rack seems to be secure. Rated 5 out of 5 by IDgirl from Best Way to Organize Spices I did the customizable option, with all baskets being the same size. It freed up precious pantry space, and all my spices are finally together and easy to find. I would suggest using the wire baskets rather than mesh for easy label reading. Rated 5 out of 5 by WannaOrganize from Easy Organizing I had cleaning supplies stashed in cabinets all over the place, often finding I had duplicates of things or that I couldn't find the product I needed. This was the perfect solution! Everything is corralled and visible. Installation was very, very easy. Rated 5 out of 5 by RichardB from So easy to install I don't know why I hadn't done this sooner. The door rack was so easy to install. I did have to have the folks at the store cut the mounting bracket since my basement door is slightly shorter than a standard door, and it fits perfectly. Rated 5 out of 5 by minicoop255 from Saved my small NYC Apartment! This shelving unit/rack is life saving. I was able to transform my front hall closet and store all of my cleaning products, ziplock bags, tin foil etc. Everyone who sees it wants one! Rated 5 out of 5 by Kittyperson from Elfa Pantry Door & Wall Rack I really love the elfa Pantry Door & Wall Rack that I recently ordered and received. I already have one in my Pantry, and I needed something to help organize cleaning bottles, etc. in my Linen closet. It arrived this past week. I have now organized all of my cleaning items on the door. The closet, and, the door rack look very neat and organized. It has given me more room to put other items on my Linen closet shelves. I really recommend this Door and Wall Rack for both closets. Rated 5 out of 5 by Wacke from love it! I just wish my door was bigger so I could add another one. Super easy to install and it holds a lot of stuff. Rated 5 out of 5 by Akorn from Functional and well made! Even after I decluttered (thanks to Marie Kondo) my pantry was still cluttered. Not now! Everything has a place. And the unit is well made and stays put when opening and closing the door. If you have a lot of spices like me, I recommend adding one or two spice racks to the purchase. Can you see any of the hardware on the other side when the door is closed? Just barely, if you look, especially if it's on a white door. You could always paint the hardware to match your door, but for me, just under 1/2&quot; shows at the top and bottom of a standard, 1.5 inch thick closet door. Will this fit a 6 foot 5 inch door? You can have the mounting bracket cut to fit any size door - that's what I did. Just realize that the bracket is designed to fit a 7' door (it's actually slightly shorter than that to make room for the overdoor hooks), so only cut off the difference between 7' and the height of your door. How long are the screws for installation directly in to a solid core door? My door is quite thin. It doesn't come with any screws. Can this mounted on the door? Our doors are thicker than standard. Yes, and it fits perfectly since the tension is adjustable. The attaching top-and-bottom brackets hold everything snug once you tighten down the top one. Be sure to read the directions. What is the delivery package size and weight? 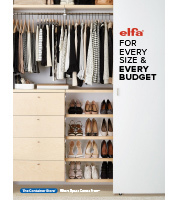 Our elfa utility Pantry Door &amp; Wall Rack ships in multiple boxes and has a total combined weight of 12.5 pounds. Can these Utility Door and Wall Racks be attached to hollow core dor with wall anchors? For mounting our elfa utility Door &amp; Wall Racks on a hollow-core door, we recommend our Anchors &amp; Screws for Hollow-Core Doors (shown below). The baskets of the utility Door &amp; Wall Rack system all mount securely and stably in the same fashion. The dimensions of each of our elfa utility Door &amp; Wall Rack accessories can be found on the components pages shown below. Is there another overdoor hook that fits smaller doors? My pantry door isn't 1 3/4&quot; thick, it's only 1 1/4&quot; thick, so the hook won't hang right on the door. It keeps slipping and trying to come off the door. I really, really love this setup and want to make it work!! I guess if worse comes to worse, we could drill holes in the door to support the standard? I would rather not drill holes into the wood if I can keep from it. Our elfa Residential Over Door Hooks are adjustable to accommodate doors up to 1-3/8&quot; thick. If this is still too wide for your door, we offer our Anchors &amp; Screws for Hollow-Core Doors (link provided below). For further assistance, contact us at 1-888-CONTAIN (266-8246).